On Boxing Day night as we approached the Gladesville RSL for the Milonga de mis Amores, the black clouds hung low and a few heavy drops hit our windscreen. By the time we were inside it was pelting down... but I needn't have worried. Obviously 2 nights without tango meant that the wild weather couldn't keep the dancers away and we had a big happy crowd including visitors from New York, New Zealand, Cairns and Perth! It's a treat to have visitors at the milonga - to meet new dancers and hear about their tango. 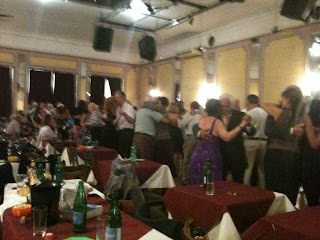 Cortinas (short grabs of music) have become a tradition at milongas that allow dancers to change partners - or take a break between sets of tango music. For me the cortina music needs to be in the mood. I like to play cortinas that come from the same period as the tango music but are from a different genre - they don't have to be recordings from that period, butsongs from that period... and I like to play cortinas that match the theme of the evening. This weekend we are doing our Blue Tango milonga - last year's was enormously popular so we are doing it again! And I have chosen songs about blue - blue eyes, blue skies, being blue... for the cortinas with songs with blue in them for the playlist. What a night! The venue looked fantastic thanks to the work of Chris from Tango Encanto, the musicians played divinely and the crowd danced! It was everything we had hoped for and more. 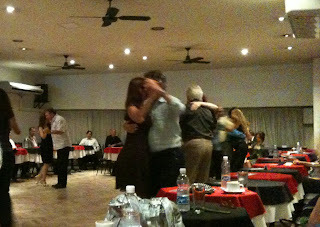 Being given the opportunity to organise a milonga with such legends as Ignacio Varchausky from Orquesta El Arranque and bandoneon virtuouso Santiago Polimeni with Fuego Blanco and their mentor, Maggie Ferguson was fabulous and the organisers pulled out all stops to make it a night to remember. The table of 12 from Newcastle were in awe, most had never seen a bandoneon before, let alone two played by such experts. 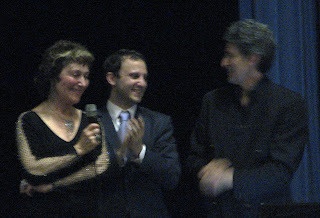 Promoting the work of TangoVia and it's endeavours in preserving tango music for the future was also a focus of the night. Last night I squeezed myself into the audio room in the Cervantes Room for a presentation by Ignacio Varchausky of the Tango Digital Archive - and I learnt some disturbing stuff about what has happened to tango recordings of the 20th century. 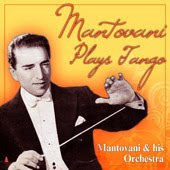 It seems we've got a real treat in store if the Tango Digital Archive can get the funding it needs to digitise the 100,000 recordings they have determined were made in the first part of the 20th century. So far we are only listening to around 20,000 (just checked my itunes library and find I am 15,000 short! - note to self to spend more on tango music!) and most of them are really bad recordings. Pretty obvious actually - there are some I have that I could never use the background noise and scratchings are so bad you can barely hear the music. There will be two! and an amazing tango orchestra led by Ignacio Varchausky, co-founder of Orquesta El Arranque, one of my favourite modern tango orchestras! 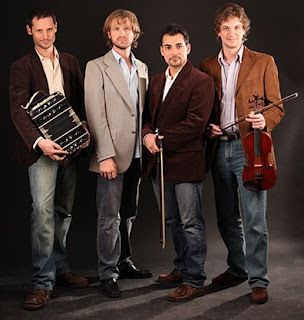 and they will be here in Bondi Junction this Thursday... at a milonga. 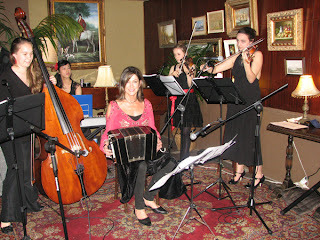 I am so excited - not just about the music but about the opportunity to dance to a real live top-notch tango band! When this was suggested to us months ago I hoped that everyone in Sydney who loved tango would drop what they were doing and come and enjoy the night! but of course that is just a pipe-dream and there will be many who miss it for silly reasons and others who have obligations. 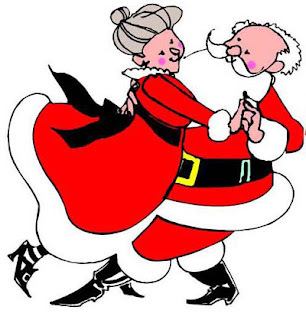 But those who come will I hope have a Tango Moment to Treasure. 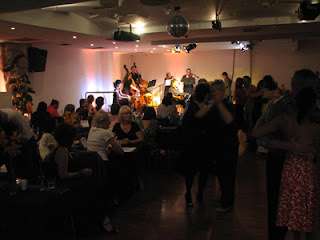 Sunday night was Tango night at Sydney's Victoria Room. 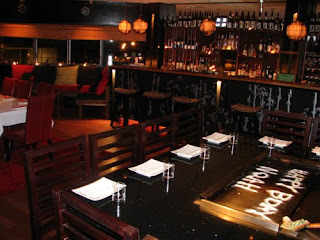 The venue's atmosphere of a comfy drawing room from times gone by, was perfect for the wet and windy Sydney night. Golden table lighting and a friendly vibe added to the feeling that you had just popped into your great aunt's for an evening of music and company - and when Fuego Blanco started playing it was just about perfect. These young musicians are constantly striving to play better and better tango and every time I hear them I am impressed by their playing - Sunday was no exception. I am not sure that Sydney's tango dancers realise just how lucky we are to have a group who are so keen to play good danceable tango music. 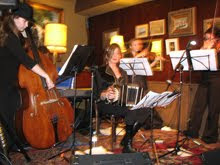 As musicians they love Piazzolla, but they also want to play tangos for dancing. Last night was Meet and Greet - the name given to last night's milonga to begin the first Sydney Salon Tango Festiva - tonight it's the Welcome Milonga. It is great to see so many new faces - people from interstate and overseas who have come to be part of this Festival. I am sure that many new friends will be made and old friendships renewed. This is one of the great sides to a festival, it gives everyone - depending on their social skills and willingness - a chance to meet and dance with people outside their usual community. Because of Sydney's appalling transport system, after about 10 pm it is hard to get anywere let alone home! we, and many others, often find themselves taking visitors back to their accommodation - there has to be something good about this world-class city having a dysfunctional public transport system. If like me you missed the Milongueando Festival that has just finished in Buenos Aires you'll enjoy reading Jenny Wood's account. Jenny is one of the principals of Sydney school Tango Encanto and this year she accompanied a group of Aussies to this unique festival that celebrates the Milongero. Taking place over a week at the beautiful Mansion Dandi Royal Hotel in San Telmo - which I was privileged to have a tour of earlier this year - this intimate festival is fast becoming a must for those who love the tango of the milongueros. You can read Jenny's account here - and, if like me, it is top of your must-do's for tango you will want to watch out for next year's festival. Maybe I'll see you there! I took these photos in the Dandi Royal in April. A few years ago - and it can't be many because she is very young - a beautiful and talented young lady (and that she is) joined the Australian tango scene as a beginner. Of course she instantly caught the eye of the men and she could have taken a few lessons and continued to be asked to dance, but she has taken it further. She has fallen completely and totally in love with the dance and the music. She has taken many classses, practised and immersed herself in the music to the point that she is now DJing at a weekly milonga. 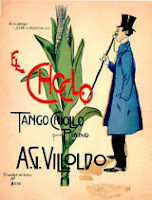 Now she has started to write a blog all about tango - and she does it very well. (This is not meant to sound patronising, as a magazine editor for 20 years I saw some awful unedited copy and her copy is excellent). 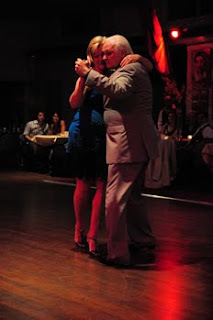 Many Sydneysiders will know Tony - he who moved to Buenos Aires about 18 months ago - and they will also know of his dedication and love of tango. When I was in Buenos Aires in April I met up with him - and met Cherie for the first time. 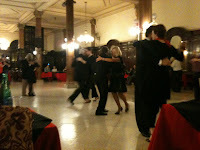 It was wonderful to have friends in tango in Buenos Aires and it really made our stay. We had some wonderful nights at the traditional milongas. 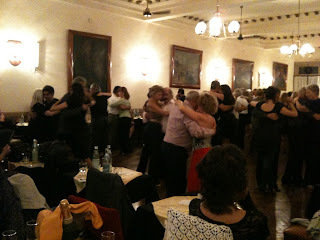 Recently Tony has been visiting Europe, including Berlin and yesterday Cherie posted a letter on her blog by Tony about the Tango Festival in Berlin - and Tony's immense disappointment at the fact that is was taken over by people mindlessly dancing nuevo...with no respect for the space of others. (Go to Cherie's blog to read the entire letter Tony wrote to the organisers). We've just had a long weekend in Sydney - celebrating the Queen's birthday even though it isn't her birthday we all get a day off! 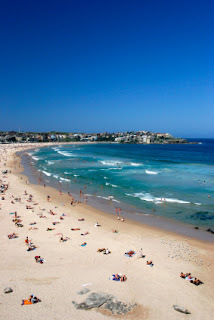 - so we took ourselves out of Sydney and up the north coast for fresh air, walks on the beach, lots of yoga and great company. We did miss the last night at Glebe Town Hall for La Milonga, which was Sydney's longest-running milonga and for many of us the first milonga where we got up and danced tango! I was sorry not to have the chance to go one last time and hope that they will be back when the renovations are finished. 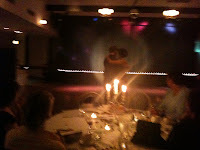 Yesterday was a day of tango for me, a tango workshop in the afternoon, a milonga in the evening. After our trip to Buenos Aires with the opportunity to watch the locals dance and do a workshop with difference I have come home determined to improve my tango - and my stamina(so more yoga and more walking too). For some time now I have just enjoyed the social side of tango and improving my knowledge of the music and have not really worked on improving my dance - there is only so much time. The workshop I did yesterday was very different to the one I did in BA but both were focussed on technique. While in BA I saw all standards of dance from beginner to beautiful! 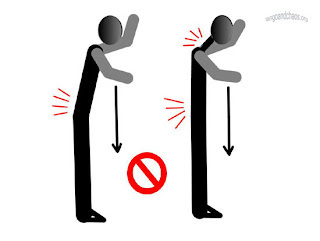 but I did not see any helicopter dancing (see below).